A few years ago, I found the best recipe for butter cookies that you roll and cutout. It has 4 sticks of butter and 4 egg yolks per batch--can you say coronary? I also found the best frosting recipe--it dries shiny and hard and tastes fabulous! So, we have started a Christmas cookie tradition. The first batch of cookies, the kids wanted to just put sprinkles on (we were going to do half just sprinkles and half frosting, but they got carried away). We had a special helper while we made them. Auntie Val came over and helped us. 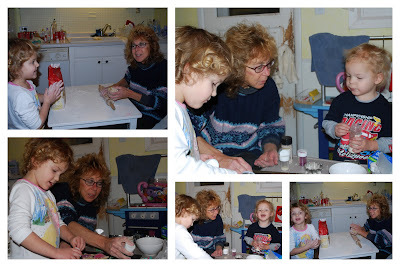 We used to go to her house every year and make Christmas cookies--we called her the "Master Baker." So it was really special to have her help. Then Bill complained that he needed ones with frosting. 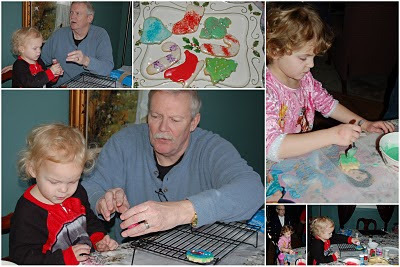 So, I made another batch with the kids and we frosted them with my parents and grandma. Aren't they pretty? I would warn you not to eat Liam's because my dad video taped him licking the frosting off of the one he was making, while making it, but unfortunately the cookies didn't make it much longer than a week or so before they all disappeared...So...4 more sticks of butter later, I made these. Note the lack of coloring the frosting. I was much less enthusiastic by the third batch...at least they have sprinkles :) I've been beating Bill off of them, but fortunately they need to only last one more day! Merry Christmas everyone! Jesus is the Reason for the Season! ps if you want the cookie recipe, and the jiggly behind that comes with it, click here For the frosting recipe, click here. Note that these taste better the day after they are made as the butter sets in. Loved the way GR was eating the cookies. And Liam was too cute, tasting each color sprinkle on his cookies. Rori was so serious and I just wanted to eat them! They sure do look yummy. Merry Christmas, Patrick family. Merry 1st Christmas, Brendan.